Died: May 5, 1852 in Sandwich Ma. at 79 yrs, 2 mos, 8 d.
3. Hannah Raymond Ellis; (August 22, 1797 – June 15, 1868); Married Stephen Ellis (1793 – 1861) Eleazer Ellis, Jr. & Deborah (Ellis)) in Sandwich Ma. on July 28, 1816; They had 10 children. 8. 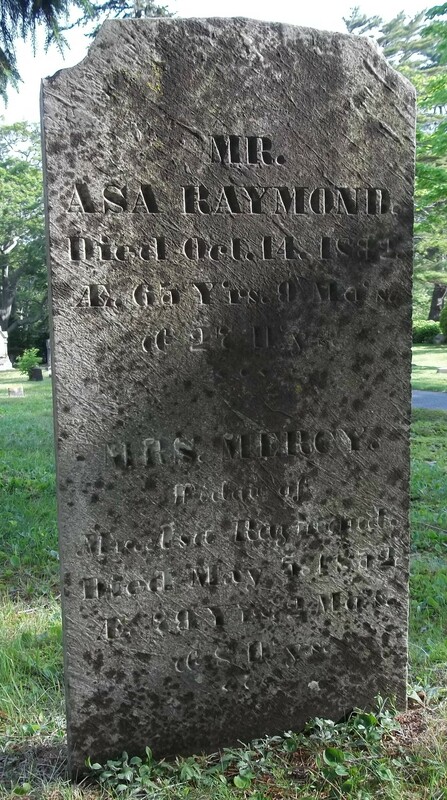 Achsah/Excy Raymond Hall Clemrnt; (November 29, 1812 – May 10, 1853); Married (1) Joseph Hall, Jr. in Sandwich Ma. 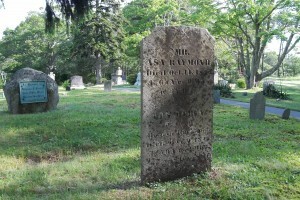 on July 2, 1830 & married (2) Isaac Clement (Abt.1803 – 1887) (Isaac Clement & Mary (–)) in Sandwich Ma. on January 30, 1840; Isaac married (2) Mercy A. Barker Godfrey (1809 – 1859) (Jonathan Barker & ?) in Sandwich Ma. on July 29, 1855 & married (3) Lucretia Chase Howland (1832 – ?) (Kelley Chase & Polly (–)) in Sandwich Ma. on September 10, 1864 & married (4) Elizabeth Kimball Caldwell Sampson (1822 – 1892) (Harvey H. Kimball & Abigail Thomson) in Sandwich Ma. on July 3, 1871.